While in Taos on vacation, I had a Mocha Borgia at a communist cafe there (not so communist that it the coffee didn’t cost 4 dollars- to each according to his need didn’t extend to “this woman really needs a good cup of coffee”, and maybe it was just “progressive”- there were sure a lot of bumper stickers on the ceiling). The Mocha Borgia was a latte with chocolate syrup and orange zest. When I read it on the menu board, I visualized a sprinkle of orange zest, rather than the worm-like pieces of peel they topped the drink with, that snaked out through the drinkhole of the plastic lid (drinkhole? is that a word?). I sat on the bench on the porch, with the kids, waiting for DH to track down the burrito stand where we had some amazing breakfast burritos on our honeymoon in 1996. I sat in the sun, sipping the tasty coffee, but with every couple of sips, a little worm of orange zest would ooze out, and I didn’t want to take off the lid and fish around for the chunks, because by this time DH had found his burrito stand, purchased his burrito, caught up on old times with the owner of the burrito stand (her sister was Mary Jane, the former owner, who had sold us burritos 6 years ago when we were last in Taos, and 17 years ago.) and I was back in the car. It got me thinking, though, chocolate and orange is such a great combination, but why not do it with extract, instead? A long time ago, Starbucks used to have a Mocha Valencia, then they got rid of it because I am apparently the only person who liked it. What about making a chocolate syrup, and using orange extract instead of vanilla? Alton Brown has a recipe for chocolate syrup, and the only alteration I have made is to use orange extract instead of vanilla.I also didn’t have as much cocoa powder as called for, so I made a 2/3 batch, which made about 3 cups of syrup. This recipe has the original Alton Brown measurements. You could totally divide the batch, and add different extracts- peppermint, cinnamon, almond? Boil water and sugar together in a small pot. 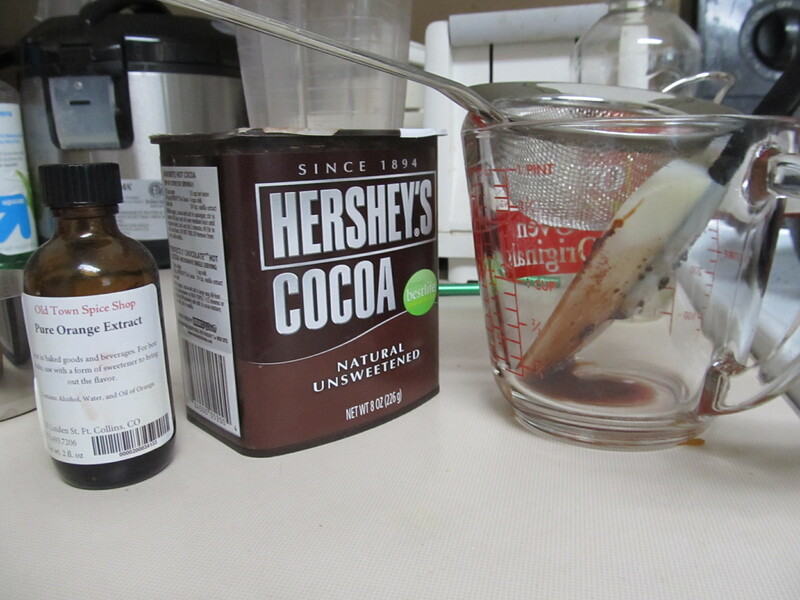 Whisk in cocoa, salt and corn syrup until solids have dissolved. Cook until mixture is slightly reduced and thickened. Add extract and stir to combine. Strain into a spouted measuring cup and let cool to room temperature, then pour into squeeze bottles and refrigerate. Previous A Green Thumb? You can Grow that Next Early Tomatoes Update- what’s today?